Now, machine quilting is easy. Beginning and experienced quilters can get perfect results every time using these tear away patterns. Each continuous border design adjusts easily to fit the length and width of your borders. Thread baste quilt layers then position the pattern on your quilt using the adhesive strips on the back, stitch through the paper following the design lines then tear the paper away. Note: Most of the patterns can be ‘echoed’ for a better fit in a wider border. All border and stipple patterns have 26′ of pattern on the roll. To calculate how many rolls you will need of Borders Made Easy pattern, add length plus width in inches of your quilt top, multiply by 2, then divide by 12 to get how many feet you will need. Each roll is 26 feet long. 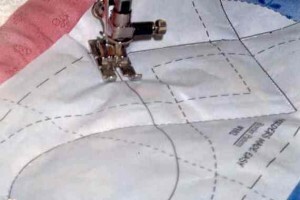 All 100 series patterns require a regular stitching foot or walking foot. Recommended stitch length 8-10 stitches per inch. All border patterns have 4 corners included in the core, or corner patterns are printed on the border strip. If extra corners are needed, you may xerox or trace corners. - Finished stitching width 3"
QME patterns used L to R: 102,107,106 Add Free Instructions to your Order, will not be automatically added with pattern purchase-One per order please! All 400 series patterns require free motion quilting and you will need a darning foot or free motion foot. Pattern #403 can be stitched using a regular or walking foot if you prefer. - Finished stitching width 2.5"
easier to remove the paper.